Today marks Emmett’s first year anniversary with our family. He brings us (me!) irrepressible joy every day! This is not a dog story. It is story of a lesson learned. You see, I never ever planned on a dog. (psst, come closer,…I didn’t really like them). Emmett embodies this lesson and reminds me every day not to worry about tomorrow, to live in today…and to be open to the unexpected. What unexpected person, thing or event has changed your life for the better? Kill me now. He is just such a cutie pie absolutely adorable. Even for a pup he is fabulous. He has these soulful eyes who is so happy and thankful. If you don’t want him, send him to me! Quite the “soulful” puppy for the “Soulful Home”! Thank you…he is my “other man” with a hairy chest! Haha…ok, I am recovering from you missing Helen Mirren…once recovered I will comment on your post. true confessions! Yes, I am catching up on my blog reading. My girls have been on Spring break from school so very active around here! Oliver such a nice name! I room here at Crow Cottage with <a href="two of the worlds bestest doggers ever (and a husband), so I totally get how you fell for this little gem. You will find you won’t know how you lived without this creature in your life before… guaranteed. I believe you are right! Your dogs are beautiful & so is Marblehead Mass.! I went to Boston College & a friend’s parents had a house there so we visited. Lovely!! 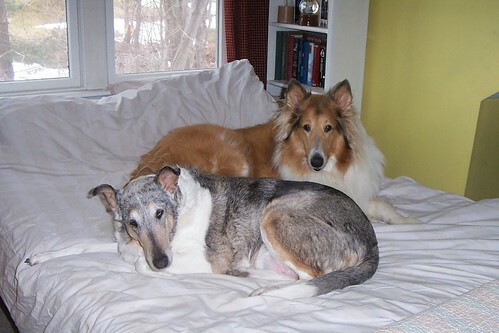 Thank you for visiting My Soulful Home, your comment & for sharing your pretty pups! Oh, what a cutie your Emmett is!! Great photos, especially the last one where he has captured his prey, and is just waiting for you to tell him what to do with it. You will never find a better, more loyal friend in your entire lifetime than a dog. Especially one you didn’t really want!! So happy you gave him a “forever home”. I just can’t believe how he has captured my heart…yes he has a forever home for sure! Thank you for visiting & commenting. I really appreciate it. I would have to say that my children are the unexpected people who changed my life for the better. I had not planned on having any kids but watching some friends of ours (who had also never planned on having kids) with their daughter gave me pause. I am thankful every single day that we took the leap and did it. I haven’t regretted a single moment and being a parent has been a wondrous ride. As for that darling Emmet, I told you when I met him that he is like a stuffed animal that’s come alive. He is certainly a great reminder of the joy of everyday living with his boundless devotion, energy and cuteness! I expected to be happy as a parent, but I agree ” the wondrous ride ” that it is has taken me a bit by surprise too. The bond is so unique and strong…and I just have sooo much fun with my girls. Here’s to moms, pet lovers and the joys of life! What a cutie!! I’m not a dog lover, but Emmett would definitely capture my heart. Definitely a good life lesson! That’s the thing Mary Alice neither was I! Can you tell I am still shocked about my feelings for this little guy? Thanks for visiting…hope Spring is there to stay for you in Virginia…My parents were in Va. a week or so ago & experienced 4 inches of snow! He is PRECIOUS! It’s easy to see why you fell in love with him. Our dog, Murphy, is a huge part of our family too. Hope you have many happy years with Emmett! Thanks Susan..and again, Congrats on getting reader/clients!! Yippee for you! hi!!! 🙂 your look is amazing! WOW! Emmett and my chelsea could be siblings!!! It is amazing how these little souls just pull at the heart strings!!!! p.s. get your “Greenies” at Trader Joe’s..TJ knock off, but just as good says Emmett & much less expensive! Thank you for inviting me to meet Emmett ~ he’s a doll! (Secret: I’m not a dog person either, but I have a little Bichon Frise “Po” who I’m madly in love with!) You have a beautiful home! So happy to get to know you a little better. I hope we can stay in touch! He is! Thanks for checking him out. I linked up at your party…such fun! Yes we will keep in touch for sure. He is insanely cute. That’s the kind of dog I want! I love Emmett. What a sweet dog. My dog is not little, but I think it is time for a second dog. So glad you are a dog lover, now. I love your little pup! Mine looks like he could be the brother to yours! Ours is a Bolognese Bichon that I got from my girlfriend’s who’s dog mated with her mom’s (same breeds.) What breed is your dog? I thought I was looking at my little Leo when I saw your photos. More stories about him would be lovely! Oh thank you Clare! We do too so very much!! Emmett is a Maltese. Apparently he is tall for the breed, but that is what he is. Would love to see your Leo. More stories on Emmett …did you see the walking tour of the neighborhood we did awhile back?